Kimchi is a traditional spicy Korean pickle, it is in essence an eastern take on sauerkraut. It is delicious, full of good lactobacilli bacteria and vegetables. 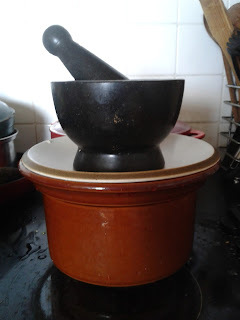 It makes a pleasant condiment or as an accompaniment to rice. 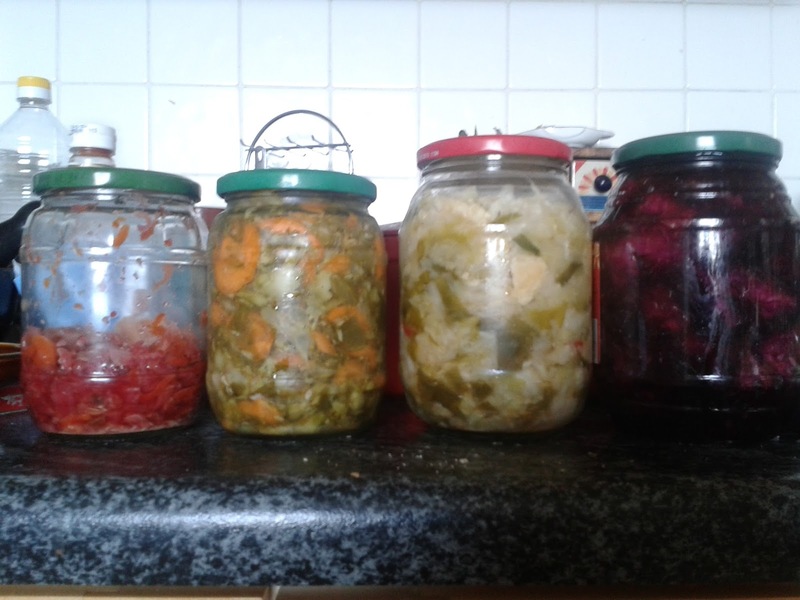 It is also a useful way to use up and preserve surplus hardish vegetables such as cabbage, carrots, radishes, Jerusalem artichokes and beetroots. 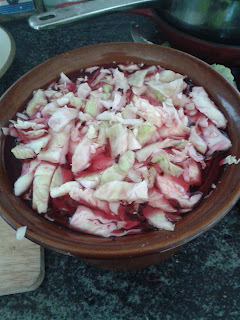 Here is the basic recipe, it is adapted from Sandor Ellix Katz brilliant book entitled 'Wild Fermentation'. A mix of vegetables to make up 1.5L or the size of your crock pot, for example, cabbage, carrots, radish, beetroot, (I have made one with sliced runner beans, carrot and broccoli, I have yet to try it). Slice these vegetables or grate them coarsely, place them in the crock pot and cover with brine. 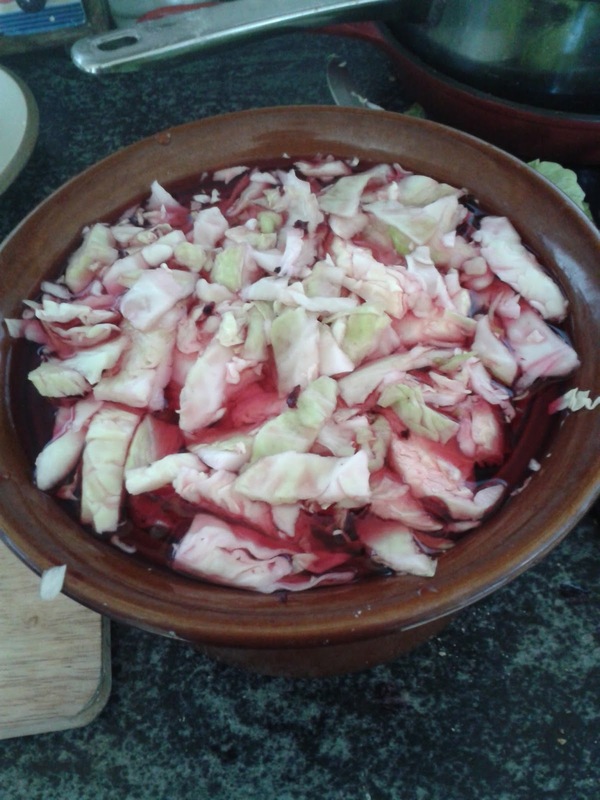 Brine in this case is made up of 1L of water with 4tbs (60ml) of non-iodised salt dissolved in it. Cover the veg with the brine, weigh it down with the saucer and the weight so as to completely cover each piece of veg with the brine. Leave for a few hours or overnight till softened. Once the vegetables are soft, drain off the brine (and reserve it for the next batch, strain it, boil it, bottle it and when cool, store in the fridge for use in the next batch) and taste the veg, if it tastes unpleasantly salty, rinse and drain it. Make up the spice mix, this is composed of finely chopped onions (leeks, spring onions etc will also do), fresh, grated ginger, hot peppers (either fresh or dried) 3-4 cloves of garlic. Pound the garlic, ginger and peppers up together, mix in the finely chopped onions and mix into the vegetable mixture, fish sauce can be added at this time (traditional ingredient, I omit it as I like to keep this pickle vegetarian friendly, even though I am not a vegetarian) Pack the vegetables into the jar (scald the jar first with boiling water) really pack the veg in so that you expel most of the air spaces. Either weight it down with a smaller upturned lid that pushes the veg down into it's juice using the pressure from the jar's own lid or check it every day for a week and push the veg back down using clean fingers. I am inclined to keep the jar standing in a bowl as it does seep as the veg is fermenting. After a week, or when you deem it is pleasantly sour, seal the jar and put it in the fridge to slow down the ferment.The kimchi is now ready to eat. The brine is good for a second batch, after which I would be inclined to dump it. If it does not taste salty enough, add an extra teaspoon or two of salt. 4 jars of kimchi made in the last two weeks.